OMG. Hilarious and horrifying all at the same time. Sounds like a yummy, great adventure! And they purr? That is just too much. That sounds awesome. I’ll have to try and go some time. Especially in Maryland with all the blue crabs. 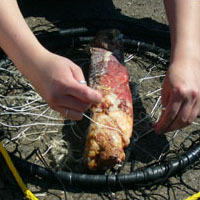 BTW, I think another popular form of bait is a chunk of bacon. Lara – I know, it’s sad that mink have to be so cute, cat-like AND smelly. P.S. I love your color on color scarf! It’s beautiful! Jamie – Bacon?!! That’s so awesome and perfect. Totally what I’m going to use next time… Thanks for the great tip! 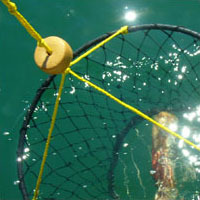 i’ve gone crabbing in australia once and any chunk of bloody meat would attract crabs. your story was quite hilarious, i could imagine it all happening. Good to know Stef. 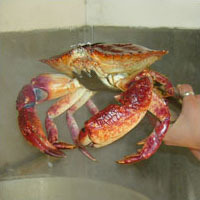 What kind of crabs did you catch in Australia? We used to use big fish heads for bait. As Stef says, basically any bloody, smelly thing will do. 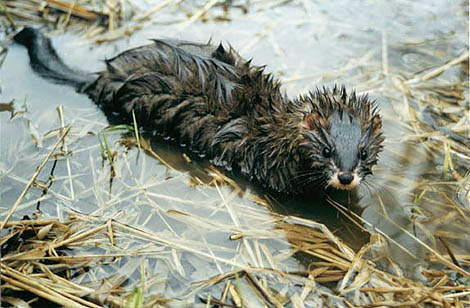 If it makes you feel any better, I’ve run into mink back when I was living way out in the country. They may purr, but they are vicious as hell, and not at ALL like a kitty, cuteness notwithstanding. I saw one kill and eat a cow. Okay, that was a lie, but they’d bite your fingers off if they got a chance. MJ – Actually that DOES make me feel a little better. I had no idea they were so vicious! B – Yeah, that’s why I was so confused at first—I was expecting something like a trap. But in the end it was more fun (and exciting) to use the ring. 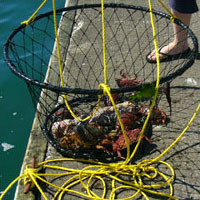 It felt as though we were truly “crabbing”! like “diwal” shellfish, shrimps, prawn,and “alimango” a fat kind of crab which have fat arms and has more delicious “aligi” that hard delicious yellow part inside its body, and have heavenly taste of white meat. In my hometown in Jaro, Iloilo City , my mother buys “Kasag” a thinner kind of crab but it is delicious as well and my mother used to make crab omelet out of it. She will first heat 4 kasag with salt until the green blue kasag turned to orange and when the juice of the crab become dry to the pan then it is cook and then she will get the crab meat from its arm and body and she will sauté a small onion and a small tomato and then mix the crab meat and separately beat one egg and add it to the crab meat mixture, and add salt and pepper to taste. Then the crab omelet will be returned to the crab shell and fry again. So you can try it yourself next time you buy crabs and see how delicious it taste with sweet smelling aroma of the crab and egg. You can eat this with freshly cooked rice and you can feel your spirits up high. Joyce – That recipe sounds delicious and beautiful! Thanks so much! i think they were called blue manna crabs or sand crabs. 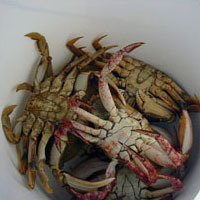 there were mud crabs too – very meaty crabs. Mmmmmm! 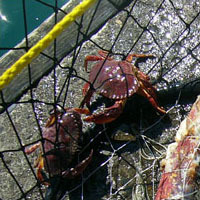 Blue Manna Crabs sound so exotic! I was BESIDE MYSELF reading this entry. very funny!! and oh, I can’t imagine the indignity of having one snap at you! I don’t eat scavengers & filters, as a rule…no lobster, crab, shrimp, scallops, mussels, etc…. after all, if you’ve got a creature that’s willing to eat something as nasty as a stanky old mink, what do you think YOU’RE eating? And I agree about the scavenger thing, but I try really hard not to think about it. Thanks for the link! The part about “Chicken neckin’” totally cracks me up! We used chicken until we stopped by the Tillamook sporting goods store and talked to the owner – he said that squid is like “candy” to the crabs. We bought some but didn’t use it in both of our rings. The ring with squid outperformed the chicken-only ring like crazy! Thanks for the tip Jon! Sounds like squid is the ticket. My brother is a commercial crabber. He said he vomits all day long when they’re baiting the pots with mink carcasses. It makes me think twice about eating crab. You are what you eat! Great blog, I was laughing.